No "recreational hostility" here. This blog guaranteed 100% snark-free. Addendum: Mickey Kaus has a different take (scroll down to February 15): bloggers are too "elite". Check this installment of Bloggingheads TV. Kaus looks and sounds much less like a schoolyard bully (he even admits to being "out of shape") than he did here, and Wright less like a schoolyard bully's victim. Is anyone up to taking Kaus's Dinesh d'Souza challenge? Another hat tip to the right: Nice piece here by Jonah Goldberg. And another: Amity Shlaes (again in yesterday's Sun) has good things to say about "new Democrats". We are being engulfed in a veritable tsunami of civility. Caveat: In response to Keifus, I must point out that my "snark-free" guarantee does not extend to comments others may post hereon. 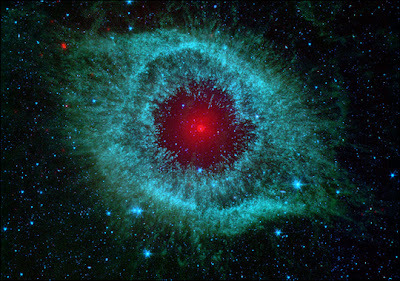 This is the Helix Nebula, in Aquarius, photographed by NASA's Spitzer Space Telescope (named for the late astrophysicist Lyman Spitzer, Jr. - see here - not for New York's new governor). The Helix is the visible evidence (though this image was made at x-ray frequency) of the death throes of a star similar to, but about three times larger than, our sun. The image was downloaded from Discovery News. I'll get over it. Two recent deaths, one of them the subject of the post immediately below, and other matters, have put me in an introspective, not-very-communicative mood for the present. There are many things I want to write about, including my long-threatened contribution to the "just society" discussion begun by El Cabrero and taken up by Hipparchia, and my promised attempt at midrash on Keifus' piece concerning nostalgia (see here). 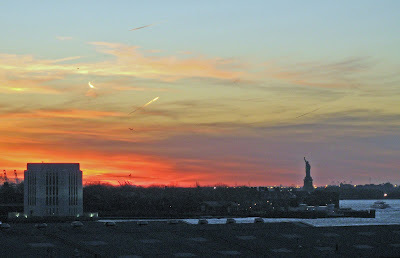 For now, I'll leave you with this image of yet another sunset seen from the Brooklyn Heights Promenade.